Before it started to air, Steven Moffat promised that series 8 of Doctor Who would be completely unlike anything we'd seen before - and he wasn't joking. Peter Capaldi's mysterious, unpredictable and at times downright unlikeable portrayal of the titular Time Lord at times evoked Colin Baker's tenure as the Sixth Doctor. While he didn't actually try to throttle his companion this time around, the latest Doctor certainly threw enough caustic barbs at Clara Oswald to provoke some of the most memorably heated confrontations between the show's stars that we've ever seen in 51 years of the programme's history, while at the same time in Danny Pink's character arc there was a hint of the redemption found by mercenary Lytton in 1985's über-violent "Attack of the Cybermen". The eighth series certainly proved full of dark themes, challenging subjects, black humour and genuinely frightening horror to an extent that the series has never before attempted, but it also aspired to moments of pure visual poetry and took time to indulge in the silliest of comedy romps along the way. No wonder that Capaldi's first year in charge of the TARDIS has proved almost as divisive and controversial as Baker's did in its day. John: An allegory for life post head trauma and a theme also explored in the excellent second series of "Agents of S.H.I.E.L.D." too. A regenerated, and bedridden, Doctor evoked memories of my own paralysis post-childhood head trauma. Awaking from several weeks in a coma and laying on a hospital bed, unable to move or communicate, but fully conscious of those around me and wanting to communicate to them. With a shaved head and savage surgical scars (worthy of Frankenstein's Monster), I was unrecognisable to family and primary school friends (it was too much for them to bare). I'd undergone my very own regeneration albeit in the wake of a primary school classroom head injury that had gone unreported. To complete the transformation; my once blonde hair, grew back brunette… Thank goodness for loving parents, wonderful doctors, nurses, Doctor Who and The Six Million Dollar Man with whom I now felt an empathy: we'd both been changed by serious injuries. Andrew: Small wonder that this episode means so much to you in those circumstances. I certainly agree that the parts of "Deep Breath" that work the best are those that bring to life the Doctor's struggles with his regeneration - the process has never felt so real, visceral and completely authentic as it does here where it really does seem to have shattered his psyche and his confidence, and left him genuinely struggling for a sense of self. Beyond the regeneration trauma, there's also the brilliantly memorable scene in Mancini's, Clara's stand-out moment when she's abandoned in the Half-Face Man's underground lair, and some welcome comic relief from the Paternoster Gang. I'm less enamoured with other aspects of the season premiere though: for one thing it felt very messy, seemingly built up from loads of leftovers which didn't really fit together too well. It also felt rather jerky in terms of pacing, and I was irked by how a major plot point (the advert in the paper) went unexplained until "Death in Heaven" - and arguably it still didn't really make sense even then. In fact the big thing looking back at the episode is how the coda where Half Face Man meets Missy doesn't really fit in with what we later find out about the Nethersphere's purpose (what's the point of storing a clockwork man in order to make a Cyberman?) And of course, the "Did he jump or was he pushed?" question which felt so crucial at the time was never mentioned again. It all seemed much less polished than Steven Moffat's usual efforts and feels rather untidy, slightly frustrating and less fulfilling than, say, Matt Smith's thrilling début in the excellent "The Eleventh Hour". John: Yes, the Half Face Man was an interesting character who was left dangling in cyberspace. Forgotten. Episode 2: "Into the Dalek"
Andrew: I remembered liking this a lot at the time, but as it came so early in the season it was the episode that I went back and rewatched in order to refresh my memory of it when I got the Blu-ray set. Would it live up to what I remembered? The answer is an emphatic yes, and in fact it was even better than I'd hoped. Right from the Battlestar Galactica-inspired space conflict sequence in the teaser, it was all just a great, fun, flat-out adventure - the kind of thing that Doctor Who has been a little lax in doing of late. It's one of the best Dalek stories in years (although admittedly that's not saying a huge amount) and really made effective use of the metal menaces both en masse as an invading, exterminating army and also on a single character level courtesy of Rusty. Plus, it continued the great terrific character development work for the Doctor and Clara that had begun in "Deep Breath", and added a number of genuinely interesting and sympathetic supporting guest characters. Added to that are some really great visual flourishes from director Ben Wheatley, while also of note is the top-notch sound design - perhaps more noticeable on the Blu-ray than it had been on its original broadcast, but really lively and active throughout. So what if it is riffing on Fantastic Voyage, this is the kind of entertaining yet intelligently layered sort of episode that Doctor Who can do better than anyone out there. There are flaws, yes (Clara spontaneously figuring out how to rewire a Dalek for example) but these are minor beats compared with the sort of plot glitches that occur routinely in most other episodes. All in all, fabulous stuff. John: A reprise of series 1's acclaimed "Dalek" episode, in which the Doctor is portrayed as much a villain as his most feared enemies, and borrows heavily from Fantastic Voyage. One of the better Dalek stories in recent years. I would have welcomed Davros' surprise return. A Capaldi/Bleach face-off would make for compelling viewing. Andrew: Indeed, I remember you were convinced Davros would return because of the voiceover on one of the pre-season trailers - which did sound incredibly like him, I grant you. On the whole I'm glad that the Daleks can appear without having to drag Davros along at every opportunity (as happened with every classic Dalek story post-"Genesis") but have to agree that a Capaldi/Bleach confrontation would be most welcome in 2015. Episode 3: "Robot of Sherwood"
John: I was immediately reminded of "The Androids of Tara" from "The Key to Time" season, but this retelling of Robin Hood was deliriously daft and all the better for it. At any moment I was hoping Brian Blessed would appear to upstage Capaldi in this throw-back to Saturday morning serials, which inspired the films of George Lucas and Steven Spielberg. I was barely able to breath seeing Clara in full Maid Marion regalia. To quote the Doctor: “Shut it, Hoody, you long-haired ninny”. How very meta. Andrew: I shall endeavour to use "Shut up Hoody" in all our future collaborations in that case! I'm genuinely pleased you enjoyed "Robot of Sherwood" so much, but I have to confess that I really didn't; well, Clara in Maid Marion attire aside. But otherwise I really hated the campy, kitsch feel to the whole thing - what's next, the Doctor teams up with Adam West in 1960s Gotham? And it just felt so out of kilter with the tone of the rest of the season - it's as if Moffat never got around to briefing Mark Gatiss on the new direction that he was going with this series; or perhaps Gatiss simply wrote the episode for Matt Smith and never had a chance to properly go back and rewrite it after the casting change. Even the bits that I liked - the dungeon scene for example - felt more like Smith material than Capaldi. And I'm still boggled by how this has a main story about a collection of robots from the future who have crash-landed on Earth and are scavenging for spare parts to repair their spaceship so that they can get home, which is exactly the story for "Deep Breath" just two weeks earlier. I thought at the time it must be a link to the series' main overarching plot line, but it turned out that it wasn't - just a coincidence, apparently. A sloppy one. John: You had me at Adam West! Andrew: For my money Doctor Who is at its best when it's at its scariest, from the Daleks through to the horror-influenced stories of the mid-70s under producer Philip Hinchcliffe. The latter tended to riff on Hammer House of Horror ground, whereas "Listen" goes instead for the more thoughtful psychological terror of an MR James ghost story, but it absolutely still holds true that the scarier the story the better the episode. This is a fabulous and original instalment, and one that actually gets better with repeated viewings where you notice more and more clever things hidden away in plain sight in the early parts that you only pick up on later having seen where it all goes. Requiring that sort of complete attention didn't make it all that popular with the casual Saturday night viewers on the original airing, but does make it one of the most rewatchable episodes of recent years on DVD or Blu-ray. It's not quite up there with the likes of "Blink" perhaps but it's pretty damn close. What's even better is how much insight it gives into each of this season's three main characters, which means it's also immensely satisfying from a drama point of view rather than just delivering the shocks. And the message that fear is to be embraced as the thing which makes us most human and which gives us our 'super power' to achieve great things is I think one of the most inspiring messages the show has ever delivered. Superb. John: Agreed. My earliest memories of Doctor Who are being terrified of the opening and closing titles from the Tom Baker era, but the allure of travelling down the time corridor was too great. Being sat on dad's lap did help, otherwise I would literally hide behind the sofa peeking out to spy if an angry Dalek had entered the room or if an Egyptian Mummy was wandering the corridors and gardens of my parents home. During childhood I never endured under-the-bed scares as my divan always contained drawers! However, we all have our own childhood traumas that cast long shadows into adulthood and the Doctor, like any flawed hero, rich in contradictions, is no exception. "Listen" is perhaps one of Steven Moffat's most deeply affecting episodes of Doctor Who to date and the realisation of themes begun in series 1. It's arguably the equal of "The Girl in the Fireplace", "Blink" and "The Girl Who Waited." Jenna Coleman delivers an acting tour de force. I've watched this episode more than once. Andrew: I don't recall ever being truly scared as a child by anything on TV to be honest, and sadly never once had the dream about a hand reaching out from under the bed. I'd add Russell T Davies' "Midnight" to your list of similarly impressive stories from the series. John: The perils of living with a life-changing trauma and overactive imagination, which has never abated. Andrew: I really liked this one too. Rather like "Into the Dalek" it was a nice, simple, straightforward adventure story that was just a lot of fun. Hard to believe that Doctor Who has never done a heist story before, it seems so obvious - as all great ideas do in hindsight. A terrific set-up with as you say some really likeable supporting characters that I wouldn't mind seeing again, and just enough timey-wimey-ness to make this feel like a proper Doctor Who episode without making it feel overly convoluted. I just wish there had been more to the break-in itself - it could have gone for a really effective Mission: Impossible feel but seemed to run out of ideas far too quickly, leaving instead a lot of wandering down empty corridors and oversized ventilation ducts - hardly the super-impregnable bank we were told to expect. The episode ended up lacking a big feel to it, leaving this as an entirely enjoyable but to be honest probably only middle-of-the-road outing. Andrew: It's the best of the 'Doctor-as-fish-out-of-water-in-domestic-setting' sitcoms that Gareth Roberts has contributed to the show in recent years, but that isn't saying all that much as I never really liked "The Lodger" and "Closing Time" as much as other people tend to - I guess that's my inner curmudgeon coming out again just as it did with "Robot of Sherwood". Having said that, I did enjoy "The Caretaker" more than I expected to - the comedy was well done, and having a fiercer central presence in Peter Capaldi as opposed to Matt Smith (whose natural inclination was always to clown around) gives this a bit more impact than its predecessors. It's good that it gives the recurring characters some room to develop and grow together having previously been kept separate, and the vicious confrontation between the Doctor and Danny is incredibly powerful. Around that, I just wish there had been more of a plot: the Skovox Blitzer makes little impression and there's more time given to planning the parent/teachers evening then there is to the Doctor's efforts to do anything about a death machine rattling around Shoreditch blowing things up. Still, better than bringing in the Cybermen and having them defeated by James Corden blubbing over them I suppose… On the whole though it felt like we'd wandered into a very weird episode of Grange Hill, and while that idea is by no means altogether unpleasant it also didn't quite feel like a nutritious full course Doctor Who meal either. Ultimately, it's simply not one that I'm going to revisit all that often. John: Evoked fond memories of The Sarah Jane Adventures. A series much missed since the passing of Lis Sladen. An actress so beloved by fandom as a whole. That said, I don't feel any impetus to revisit anytime soon. Episode 7: "Kill the Moon"
John: Doctor Who can work wonderfully as fable and this is an endearing example. What begins as a moon base under siege, a theme reprised throughout the series' hallowed history, develops into an entirely different beast. Literally! Andrew: I was really impressed by "Kill The Moon" at the time - the Alien-esque sequences with the giant spiders were fabulously creepy, the depiction of the lunar landscape strikingly effective, Hermione Norris fabulous as always, and the dilemma about what to do about the unfolding situation a genuinely interesting and absorbing one. Unfortunately, time and distance have left me increasingly dissatisfied with the episode because of its spectacularly careless approach to the science. For sure, classic Doctor Who was often on similarly shaky ground when it came to science (Terry Nation never did get the hang of cosmology, and David Whittaker's misunderstanding of how radiation worked was hilarious) but I've never seen an episode that got so much important stuff so badly wrong, even things that should have been picked up by a basic error-check - the moon's age implied at one hundred million years instead of the actual four billion, for example. The big idea of Earth voting by turning its lights out also makes no sense (only a small sliver of the population could vote as the rest were either in daylight or asleep or on the wrong side of the planet.) Since the mystery depended on the Doctor decoding the scientific clues - which actually made absolutely no sense - it all left a terrible flaw in an episode I really, really wanted to love. John: There's nothing wrong with a flawed masterpiece. Episode 8: "Mummy on the Orient Express"
Andrew: Another really good episode, although a little patchy. The sequences with the Mummy itself were brilliantly effective, despite (or perhaps because of?) the repetition of the countdown to each death, and the denouement delivered really good character development for both the Doctor and Clara despite this being a 'companion-lite' episode if you looked closely. However the episode never really managed to make fully effective use of its 'spacetrain' setting which was a shame and it could also have done more with the Egyptian theme as well, but instead opted to bolt on what proved to be a wholly unnecessary final act involving 'Gus' and some unexplained/unresolved master plan behind the events which could easily have been dropped altogether to allow for more time on the main plot rather than making it all feel too rushed. I still enjoyed the episode, but a little more self-restraint and firmer focus on the core elements would have made it so much better. John: For reasons unknown, I tuned out during this episode much to the dismay of fellow Whovians eager to see whether or not I compared this favourably to the Fourth Doctor's "Pyramids of Mars". Can't add more than that. Andrew: Perhaps this is the one we need to tempt you back into spending some time rewatching over Christmas? Just to be sure! John: The tone of this episode compared favourably with The Walking Dead episode "Us" from series 4! Genuinely chilling, and again Clara was front and centre. Of course this has been a bugbear for some fans this season, many of whom have acted as self-appointed spokespeople for the community at large. To invoke Taylor Swift: "Shake It Off…"
Andrew: What, there were people who didn't like "Flatline"? I find that impossible to countenance, I really do. I thought this was a fabulous episode, a true Doctor Who classic episode, one that combines an incredibly intelligent and well developed high concept SF idea with some stunning and unique visuals along with some genuine chills and several laugh out loud moments - especially the Doctor invoking Thing from The Addams Family to get the TARDIS out of danger which has to be my favourite moment of the entire season. "Flatline" even manages some major character development for both the stars, which is especially impressive given that it was the 'Doctor-lite' instalment. That it managed all this in a script that managed to hit its 42 minute running time spot on without feeling either too rushed or drawn out at any point is especially impressive and singles out Jamie Mathieson (who also contributed "Mummy") as the writer of the season as far as I'm concerned. John: I meant the constant stream of moaning about Clara! That she should leave because she's (almost) the longest running companion of the current series, which is the most tenuous of arguments. A character should depart when it serves the dramatic impetus of a series (or an actor's real life commitments) and not satiating the fragile whims of fans. Andrew: Agreed. I have nothing but good to say about Jenna Coleman, she's been excellent throughout. As for her needing to leave because she's nearly the longest running companion since the reboot - well, phooey. I'm completely with you on that score. In fact it feels to me that we're only just starting to get to know her and there's plenty more to come. After all, Amy was around for two and a half seasons while Clara is only at one and a half: another season with her on board is more than entirely justified. Episode 10: "In the Forest of the Night"
Andrew: I'm afraid for me this was the second dud of the season, after "Robot of Sherwood" - and that's such a shame as it could have been wonderful. You mentioned 'fable' when referring to "Kill The Moon" but for me that's a tag far better applied to this episode. Because it has more of a fantasy/fairytale feel to it I'm willing to extend it a lot more latitude to its scientific waywardness than I was to that previous story which so wanted to be serious high-concept science fiction but missed the mark badly. "In The Forest Of The Night" was actually quite charming for the first half - the imagery of the overgrown London was wonderful, and having some time to wander around and explore was much appreciated. But then it turned out that the story had nothing to do or say, except for a few 1960s eco platitudes, and the Doctor himself was superfluous to requirements which meant that the whole thing deflated like an overcooked soufflé. The idea that the Doctor would simply up and leave - and moreover, that Clara would turn down the chance to save the kids and Danny - all rang horribly false, so it even failed rather badly on the character development front. John: I confess to missing this episode for no better reason than catching up with Arrow and The Flash. Andrew: You missed an episode of Doctor Who? I'm speechless, I really am. Please hand in your Whovian credentials at the door on your way out. John: I'll delete all reference to Doctor Who in my social media bio post haste. But, seriously, my Humax Freesat+ box decided to fail (after 6 years of stoic service) and I didn't get around to catching up on BBC iPlayer. Plus I got distracted with playing Destiny on PS4 (ironically with Doctor Who production staff). John: The look of the Cybermen, in the current run, still bothers me! They're the illegitimate spawn of Metal Mickey and Metropolis' Maria. Seeming on the verge of a dance number inspired by Janet Jackson's excellent "Rhythm Nation" pop promo from 1989. That gripe aside; an excellent episode in which Missy's (arguably unsurprising) identity is revealed. Andrew: I have no problem with the current look of the Cybermen, although I do wish they'd kept some of the more effective upgrades that Neil Gaiman bestowed upon them in "Nightmare in Silver." Instead they seemed back to their old, stomping-about selves in this one although the Iron Man-esque air thrusters were a long overdue addition. Considering that their appearance here wasn't a surprise (the secret simply couldn't be kept once they needed location filming outside St Paul's) I thought the episode got huge mileage out of 'teasing' their presence in multiple ways through the set design and music cues. I guessed that it was the Cybermen in the Telos tomb-like water tanks the minute they appeared, but the way they were then slowly revealed in back of shot as the water drained out was a masterstroke by director Rachel Talalay. Talking of masterstrokes, the widely-expected reveal of Missy's identity initially underwhelmed me but I was quickly won over by the writing and by Michelle Gomez's dazzling portrayal - I look forward to her rapid return. Overall my one reservation about the otherwise excellent slow-burn episode was the idea that the dead can 'feel' what happens to their bodies after death which I think is just too genuinely horrific and emotionally upsetting for a general audience, and insufficiently refuted by the writing later in the story. It still bothers me. Episode 12: "Death in Heaven"
Andrew: Probably the most traditional season finale Steven Moffat has ever written for the series, although the dark and morbid feel to the whole endeavour still means it's light years away from the huge, fun and cathartic climactic romps that Russell T Davies specialised in. I think Moffat was trying to do and say and awful lot of important things here (when is that ever not true of Moffat?) but he doesn't quite knit all the different strands into one compelling narrative as successfully as he needed to in order to make this episode entirely fulfilling. There's the Cybermen, UNIT, the Master, Clara, Danny's fate, resolving the series arc and more besides and they all feel like they're fighting for individual attention rather than working in harmony toward a single resolution. You could pick on any single element (I'll go for Missy, who is ultimately dispatched with almost obscene haste) and say that a lot more time needed to be spent on it. All that said, the episode does the job and wraps up the season pretty well, and also manages to sidestep around almost all of the potentially disastrous potholes that would have been so easy to fall into given the nature of the topic of death which pervades the episode. I'm still not wild about the idea of the Brigadier's corpse being cyberised to be honest, but I accept that it was done with good intentions and out of respect for the character and for beloved actor Nicholas Courtney, and to give both of them the proper heroic send-off and final salute that they deserved. John: Have a love/hate relationship with the this episode. Like yourself, I have reservations regarding the Brigadier scene. It left me wishing the late Nicholas Courtney had lived to have screen time with Capaldi. However, Clara's understated farewell was deeply affecting. Less is more and Coleman and Capaldi looked genuinely tearful. Haven't cried as much, during an episode, since Matt Smith's farewell last Christmas. Andrew: It was probably the best 'farewell' Moffat's written in his time as showrunner: you'll recall that I have major issues with "The Angels Take Manhattan" that wrote out Amy and Rory, and similarly didn't think much of "The Time of the Doctor" which saw Smith bow out. But right now I'm preoccupied with the question of whether this is really the end of Clara or not given that she returns in the Christmas special, so I guess we really need to see how that plays out before we can properly appraise the ending of this episode. John: Hmm, may be one to revisit in the New Year. John: One of the strongest and most cohesive series to date, and a masterclass in characterisation. This series, more than any proceeding it since 2005, deconstructs the Doctor as hero in the wake of regeneration as traumatic experience, while Jenna Coleman has carried the series with aplomb acting as the audience and trying to make sense of an alien Doctor. No longer constrained by the confusing 'Impossible Girl' mantel, Clara Oswald has earned her place as one of my favourite companions and evokes Sarah Jane Smith. Andrew: It seems we're very much broadly in agreement, which is rather a bombshell given that this series has divided fandom like few others. My initial off-the-cuff feeling after the season finale aired was that this had been the best run since David Tennant's last full season in 2008 with Catherine Tate, but I went back and did a slightly more scientific study by awarding marks out of ten for every story since the 2005 reboot and then taking a season average. And guess what? Series 8 did indeed turn out to the the best season since Doctor/Donna! That's not to discount the Matt Smith years by any means - there were some real corkers among them - it's just that this year seemed to be more consistent overall and have fewer missteps, together with a compelling performance from Peter Capaldi as a very different sort of Who from Tennant/Smith. And I too loved Jenna Coleman this year: she was good even when saddled with that 'Impossible Girl' gubbins that prevented any genuine consistent characterisation, but this year she got good story lines on top of proper character development and Coleman more than made the most of the opportunity. I'm still hoping that she'll stay on board for a time to come even though "Death in Heaven" seemed designed to wrap things up for her. John: My favourite stories (in no particular order) were "Listen", "Into the Dalek", "Kill the Moon", "Flatline", "Deep Breath" and "Time Heist". Good times! Andrew: Mine would be "Flatline", "Listen" and "Into the Dalek". Honourable distinctions also to "Deep Breath", "Time Heist", "Mummy on the Orient Express" and "Dark Water". As for my least favourite stories, I'm afraid those are much easier to single out: "Robot of Sherwood" and "In The Forest Of The Night" as you probably could already tell. May we take this opportunity to wish all our readers a fantastic holiday season, whatever you may be doing, and see you in the New Year. Doctor Who Series 8 (which includes audio commentaries and the full series of Doctor Who Extra behind the scenes featurettes) was released on DVD and Blu-ray on November 24 2014; series opener “Deep Breath” was already available as a standalone release with different extras. The 2014 Christmas Special "Last Christmas" airs on BBC One at 6.15pm on Christmas Day (December 25) and will be released on DVD and Blu-ray on January 26, 2015. Couldn't let this pass by without acknowledgement. Star Wars: The Force Awakens premieres December 18th, 2015. That's one year from today. I'll be covering much more Star Wars news in the New Year. 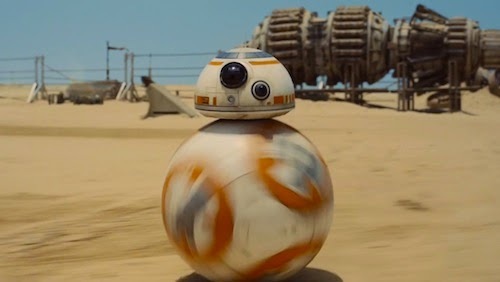 How excited are you for Star Wars: The Force Awakens? Let me know in the comments below. 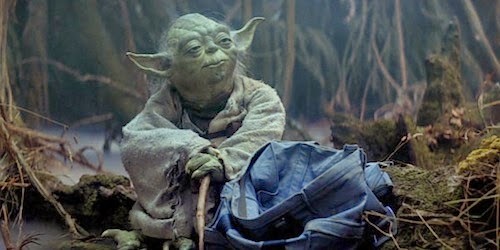 Frank Oz is reprising his beloved role as Yoda in an upcoming episode of Star Wars Rebels, reveals TV Guide. In Path of the Jedi, Yoda's disembodied voice will be heard offering counsel to fledgling Jedi Knight Kanan and his new padawan, Ezra, on the remote planet of Lothal. Path of the Jedi airs Monday, January 5 on Disney XD. Excited for Yoda's return? Let me know in the comments below. 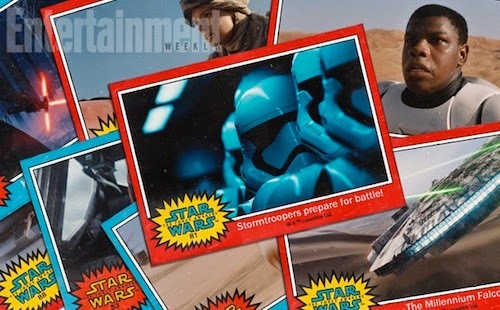 Director JJ Abrams opens his mystery box, exclusively in Entertainment Weekly, and names the characters, revealed in the first teaser for Star Wars: The Force Awakens, with a retro Topps twist! “I'm only sorry we couldn't give everyone a stick of gum,” Abrams said. Did you collect Topps trading cards back in the day? Let me know in the comments below. Microsoft has announced it is publishing Rise of the Tomb Raider for Xbox One and Xbox 360 in late 2015. The Redmond-based company's head of global product marketing Aaron Greenberg revealed the news on Twitter. "Yes we are publishing Rise of the Tomb Raider," Greenberg wrote in response to a question about publication. Square Enix expanded upon this. 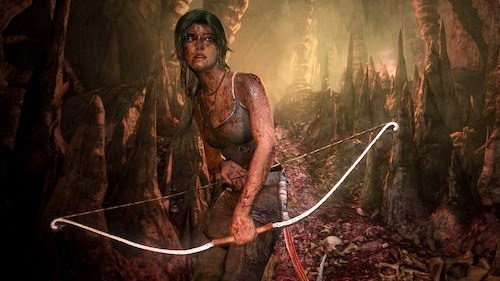 "Microsoft will be publishing Rise of the Tomb Raider on Xbox," the company said. "Microsoft has always seen huge potential in Tomb Raider and they will get behind this game with more support across development, marketing and retail than ever before, which we believe will be a step in continuing to build the Tomb Raider franchise as one of the biggest in gaming." This follows last weekend's reveal, during the PlayStation Experience, that Street Fighter V is a PS4 and PC exclusive. A pet hate of mine; third-party exclusives can be divisive amongst fans and fuel bitter rivalries. As an owner of PS4 and Xbox One consoles, I have the luxury of deciding which platform to purchase for, but many gamers don't. Will you buy an Xbox One to play Rise of the Tomb Raider? Let me know in the comments below. Marvel's Star Wars #1 could be one in a million! According to Comicbook.com, Marvel is expected to sell 1 million copies of Star Wars #1 when it goes on sale in January 2015. The new comic series, which marks Marvel's return to a galaxy far, far away, is set between A New Hope and The Empire Strikes Back. This echoes the fabled daily Star Wars comic strip, by Archie Goodwin and Al Williamson, republished in the 1990s by Dark Horse Comics. 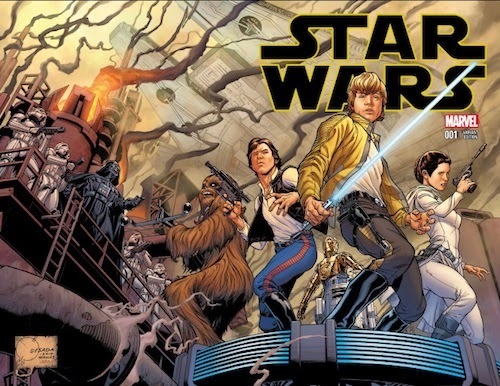 Marvel Star Wars is written by Jason Aaron, with artwork by John Cassaday. Marvel's original Star Wars comic series was the first I regularly followed and looked forward to an annual at Christmas: inspiring play with new action figures and accessories. So, I won't be hesitating to download a digital copy on day-one, unless a kind reader can ship me a hard copy (there are no longer speciality stores near where I live). Excited for Marvel Star Wars #1? Let me know in the comments below. Today Sony will announce pre-order details for its limited edition 20th anniversary PS4 during the company's keynote at the PlayStation Experience. 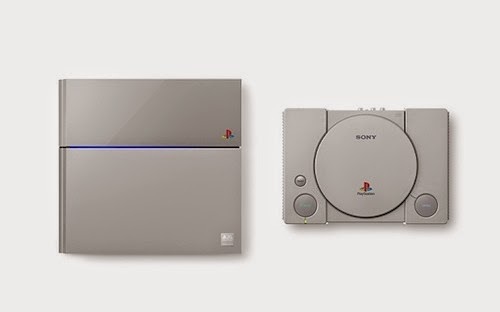 The console, in original gray to commemorate the brand that obliterated the Nintendo and SEGA duopoly, is limited to 12300 units. Most fans (including myself) will have to settle for the free classic PlayStation theme, which is downloadable from PSN. Pro-tip: disable Key Tone (found under Settings) to keep it old school. The 20th anniversary PS4 will be available to pre-order from the Sony Store worldwide. Will you be pre-ordering one? Let me know in the comments below. Director Sam Mendes (Skyfall) will reprise directorial chores for the upcoming James Bond movie. Spectre. Spectre - Special Executive for Counter-intelligence, Terrorism, Revenge and Extortion - was the bane of Bond's life in the 1960s and this may mark the return of nemesis Blofeld. 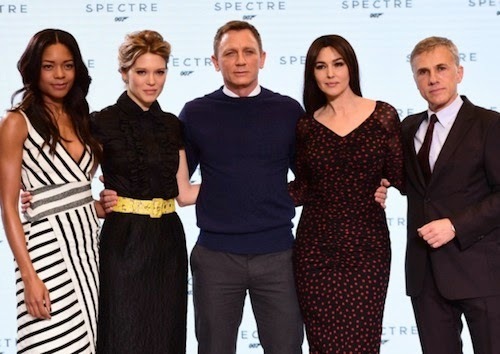 "I've wanted to involve Spectre for many years and Spectre is back," Bond producer Barbara Broccoli said at Thursday's launch event. Mendes reunites with Daniel Craig, playing the titular character for the fourth time, and adds new cast members including Andrew Scott (Sherlock) and Monica Bellucci (The Matrix Reloaded). Spectre is scheduled to be released on November 6th, 2015. 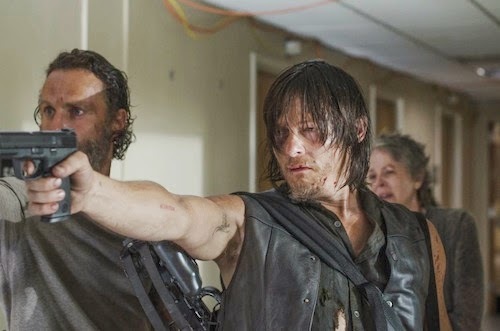 AMC's Facebook page whipped up a frenzy of anger from fans when it posted a major spoiler for the mid-season finale for The Walking Dead S5 before the episode was aired around the world. The company has subsequently apologised. Again, this highlights the subject of spoilers and it's worth pointing readers to a series of blog posts, co-written with Andrew Lewin, in which we discuss Doctor Who and Game of Thrones amongst others. What began life as an aborted Nintendo SNES CD-ROM add-on celebrates the twentieth anniversary of its launch in Japan this month. Many happy returns of the day, PlayStation! Sony's first foray into home consoles, the brainchild of Ken Kutaragi, was released at a time when I'd given up gaming (my undergraduate grant only went so far and I was the proud owner of an Apple Macintosh Performa). My enthusiasm was rekindled within seconds of seeing Ridge Racer's, now iconic, loading screen on a friend's freshly imported PlayStation. Who doesn't savour the visceral joy of blowing up alien spacecraft? I wouldn't own a PlayStation, myself, until 1996 when I began a love affair with Tomb Raider that endures to this day. I've owned every iteration of PlayStation and the PS4 is, barring multimedia support lagging behind PS3, the best yet. 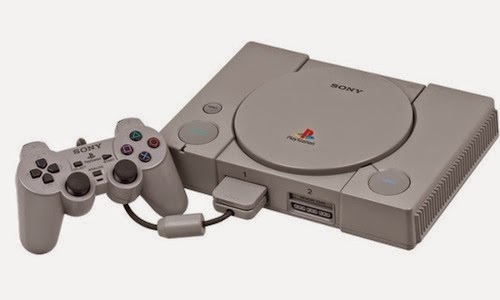 What's your first memory of PlayStation? Let me know in the comments below.